What a great photo. I’m glad you finally got to use it. Lovely poem. I especially like the last line. Wonderful photo and haiku, Matt. I can feel the heaviness of those metal bones. And now you’ve put me in the mood for autumn, too! I’m with Laura– love those metal bones, Matt. Hope you’re finally getting some time to rest and recover! Thanks, Michelle. I do have a little more time now…as you now know, I managed to write two poems in one afternoon, so that was a thrill! Love it, Matt! Lovely both in picture and in words. Autumn is my favorite season. Bring it on!!!! Glad you liked it, Karen! I like those two-toned beauties. Oh, now that’s a nice truck – got to show this beauty to my husband. He loves old pickups. I know how your hubby feels…I wish it was mine! Well, you’ll have to come visit so they won’t just be dreams, Jane! It’s Spring here and I am glad to see it! But I love your offering, with the colours of fall. Great match between poem and photo. Thanks, Sally! Yes, with winter behind you I’m sure everyone there is looking forward to spring! Love the reds in the photo–I wonder if we’ll have any reds at all this year? Some leaves have turned brown, bypassing the color, and have already fallen. We have some beautiful reds, pinks, and golds already up here…you’ll have to travel north again and visit! Thank you, Jama! I always get a kick out of well-placed enjambment – not just mine, but even someone else’s poem – because of the weight it carries. In this case, that phrase not only describes the truck’s action towards the tree, but it implies the truck’s eyes ‘are’ young. 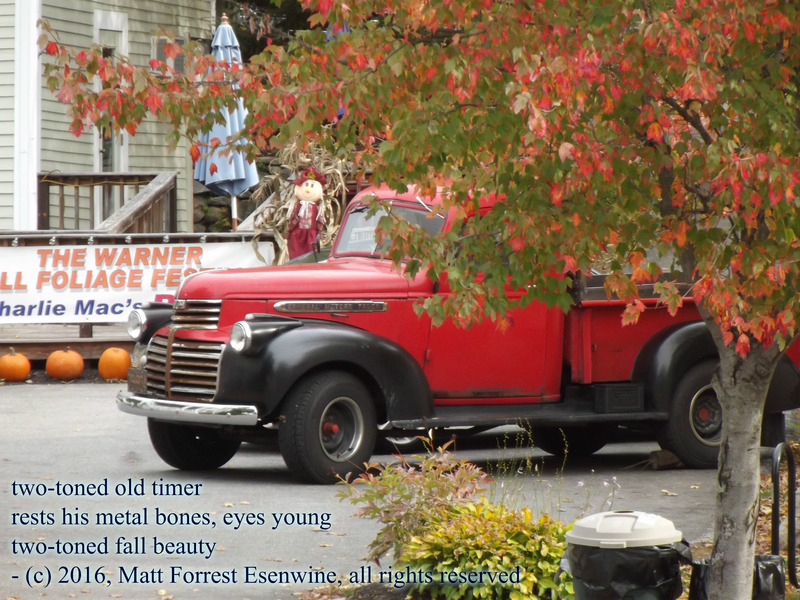 Matt, I find the composition of this photo paired with your words: two-toned beauties and the contrast between old timer and eyes young a great composition. I am capturing both the poem and the credit to your wife for the autumn gallery. Did you send me your summerscapes poem yet? I am on a family trip but will unveil the summer gallery after next weekend. Thank you, Carol! The photo credit is actually for my daughter, Katherine – but I appreciate it. And I don’t recall if I sent you the summerscapes poem, but I will either tonight when I get home, or tomorrow!